It is finally Fall in beautiful Lancaster county Pennsylvania. The leaves are beginning to turn in one of the most picturesque areas of the country. Halloween, Football and Hunting are on everyone’s mind. And in PA, guns and hunting head the list. On November 5 & 6th, Morphy auctions will be hosting their spectacular Fall firearms, militaria and fishing auction. If you can make it out this two-day auction event, you will not be disappointed. We are offering one of the finest early collections of high grade Weatherby rifles ever presented. Our Luger and Broomhandle collection consists of some of the finest and rarest models known. We have an offering of collectible ammunition not seen in the hobby in years, if ever. If you like quality Pennsylvania long rifles, we have some incredible examples from a lifetime single collection. If you have an itch for Colt 1911’s, how about a boxed pre-war National Match, a .38 Super Match, boxed pre-war A1 commercial from 1925, numerous .38 supers, military and commercial. Looking for Smith and Wesson’s, we have more than 50. 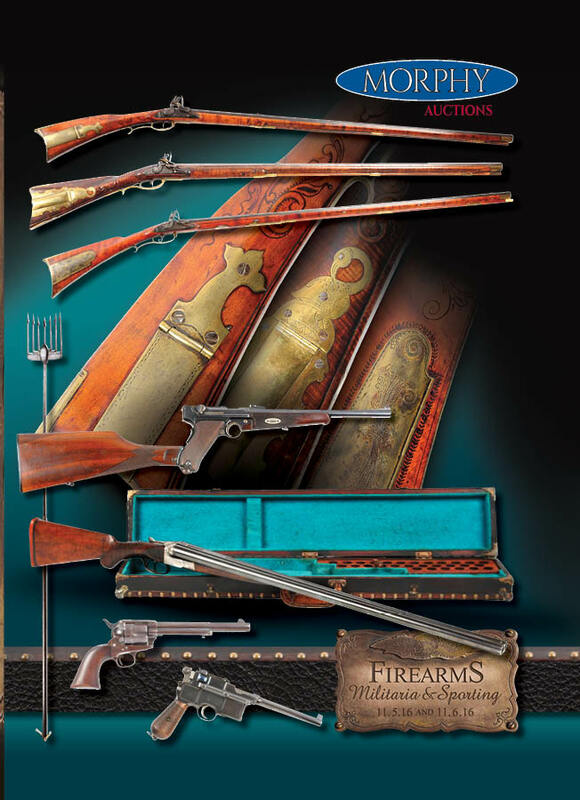 Winchesters, Marlins, fancy shotguns and good hunting guns, they are all here. Militaria is in the house and one of our fastest growing fields. Antique fishing lures and equipment are amply represented. Two of the highlight pieces include an id’ed martially marked Henry in the finest condition we have ever seen along with a Volcanic 8” Navy model and the nicest UMC cartridge board to ever surface. Our November auction has something for everyone with our high-end, collectible selection good usable hunting and target weapons. Try and set aside a wonderful fall weekend in Amish country, it will be a weekend to remember and as always, if you can’t make the trip, our on-line and phone bidding makes it possible to participate from anywhere in the world. We look forward to seeing you. Morphy Auctions’ Late Fall Sale to Feature A Full Range of Outstanding Handguns, Rifles, Shotguns, Knives, Militaria, and Fishing Collectibles. This highly anticipated two-day auction event offers enthusiasts almost 1,400 lots across all collecting categories and price points. Morphy Auctions is pleased to announce its upcoming Firearms, Militaria, and Sporting sales event to be held on Saturday, November 5th and Sunday, November 6th, 2016. This auction follows on the heels of the company’s recent $1.46 million firearms sales event in July, and further positions Morphy’s as an emerging leader in these categories here in the United States. All lots from this upcoming November sale are on display in Morphy’s Denver auction gallery and available for preview now. This auction also presents a double barreled selection of over 130 antique rifles. A fantastic assortment of Pennsylvania flintlock rifles will undoubtedly spark a bidding war amongst collectors. These include lot #407, a Bucks County fullstock flintlock rifle detailed with a brass wearplate engraved with a large Pennsylvania German chicken-eagle, estimated at $25,000-35,000; lot #405, an elaborately carved and decorated Bucks County flintlock rifle attributed to John Shuler, estimated at $12,000-18,000; lot #400, a fine, golden age relief carved flintlock rifle signed by Nicholas Beyer of Dauphin County, estimated at $15,000-25,000; lot #401, a relief carved Lehigh County flintlock rifle possibly by John Moll, estimated at $15,000-25,000; and lot #403, a Lehigh County fullstock flintlock rifle attributed to Kunz, estimated at $15,000-25,000. Other high caliber antique rifles selections in this sales event include lot #408, a martially marked Henry Lever Action repeating rifle with provenance, one of the finest of its type to surface in memory. According to Springfield Research, this rifle was issued to Private Matthew Johnson, Company K, 73rd Regiment, U.S. Veterans Volunteer Infantry, on May 13th, 1865. This remarkable piece of history is estimated at $40,000-75,000. Lot #406, an untouched relief carved Kentucky rifle, attributed to Leonard Reedy, features a full length figured maple stock in the typical style of the Womelsdorf (PA) gunsmithing school, is estimated at $20,000-40,000. And lot #404, a rare and highly desirable silver mounted percussion over/under Swivel Breech rifle by Gibbs is handsomely decorated with a four piece pierced silver patchbox engraved with checkered panels, acanthus leaves, ‘C’ scrolls, flowers and foliage, and a vacant silver oval wrist escutcheon with sprigs of engraving at the top and bottom. This sterling example is estimated at $18,000-25,000. This sale’s selections of more modern firearms also hits the bullseye. The first big gun in this category is lot #474, a Francotte Grade A Trap Boxlock shotgun attributed to Theodore Roosevelt, which is estimated at $50,000-80,000. This executive level example comes with its solid mahogany case which is detailed with an engraved plaque reading “Theodore Roosevelt, PRESIDENT, UNITED STATES AMERICA” as well as a letter of provenance and two factory letters confirming its authenticity. And the second is lot #369, an incredible collection of four consecutive c. 1935-45 Portuguese Lugers with accessories, estimated at $30,000-50,000. All four handguns have matching numbers, as well as their original holsters, magazine pouches, loading tools, and metal top cleaning rods. Given their limited production and era of manufacture and distribution, it is astonishing that these four Lugers have remained together, and in such fine condition overall. This auction’s selections of fishing accessories, lures, reels, and rods should satisfy all collectors hook, line, and sinker. Lot #1021, a 71” long ice fishing spear attributed to William Scagel – the world famous maker of knives, hatchets and decorative iron works – is estimated at $15,000-20,000. This amazing functional and decorative spear comes with a letter of provenance as well as its very heavy leather point protector, which also appears to be by the hand of Mr. Scagel. And it’s easy to get wound up over lot #1061, a Philbrook & Paine marbleized salmon reel, estimated at $15,000-20,000. This rarely seen c. 1880 raised pillar reel is in excellent condition and considered by many to be the most esthetically pleasing and highly sought after model by reel collectors worldwide. Ammunition, books, swords, uniforms, and other military ephemera – including lot #881, an outstanding Union Metallic Cartridge Company framed cartridge store display board, estimated at $15,000-25,000 – round out this targeted auction event.